Most BlackBerry users are BlackBerry users for the smartphones’ most notable feature: security. BlackBerry 10 and legacy BBOS is nearly impenetrable, as two of the most secure enterprise and consumer smartphone operating systems of choice. Unfortunately, for your friends with an Apple iPhone or iPad, who live in Australia or New Zealand, they haven’t enjoyed such security. Just when they thought they could sleep easy at night, they were awaken to a seemingly bizarre message. 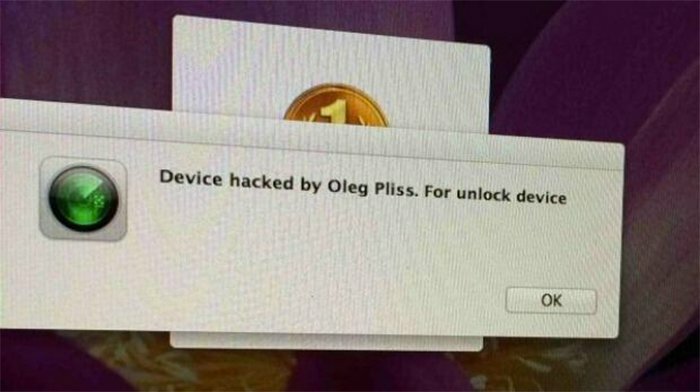 Many users awoke to an alarming sound with a message on the screen reading “Device hacked by Oleg Pliss” and a demand of between $50 and $100 to unlock it. How did the hacker compromise these devices? The exploit uses the “Find My iPhone” feature, which allows users to remotely lock their iPhones and iPads via iCloud in case the devices are lost or stolen. Apple hasn’t yet publicly commented yet on the major vulnerability. Some users have reported they could get around the hack if they had previously used a passcode and then restored via iTunes. For those who didn’t use a passcode, they were in for a little harder recovery as the hacker had made a passcode for them. Though, it may be possible to enter the wrong code six times to disable the phone and then restore it using iTunes. Apple has been taking a beating lately in terms of security. Recently it was revealed that email attachments were not encrypted in iOS 7+, despite it being a feature Apple repeatedly touted. Nevertheless, this is just one of many instances where a competing platform has inadvertently helped give BlackBerry another leg to stand on.